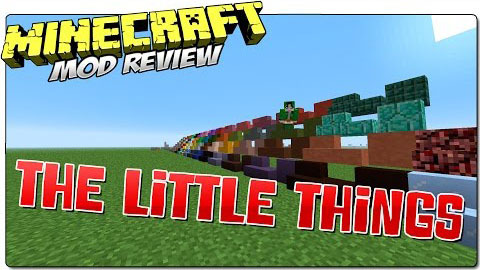 The Little Things Mod adds to the game many little stuffs such as blocks, recipes and items that fit into Minecraft while still maintaining the feeling of “Minecraft”. If you start asking yourself if Nether Brick always had Slabs or argue that of course Diorite has Walls and Pillars than everything turned out right. Stairs, Slabs, Walls, Chiseled Blocks and Pillars for all the major Building Blocks and also some that really should be. You want to build an Ice Castle with Packed Ice, no Problem, you now have everything you need for that and more. The Ore Blocks are no exception from that change. Grass, Dirt, Coarse Dirt and Gravel did get something too – Stairs and Slabs. And Leaves can now be also crafted into Walls for Decoration! A completely new Blocktype are Vertical Slabs! They can bend around corners or form a “pillar” depending on how you place them – similiar to stairs. 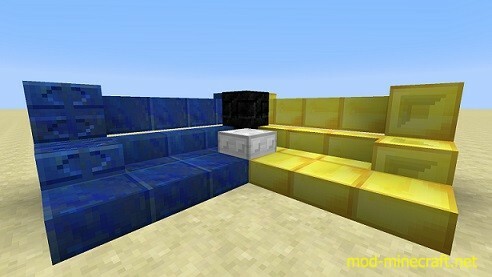 These were also added to most blocks including Glass, Glowstone and Bookshelfs! To craft all the existing Blocktypes like Stairs, Slabs and Walls, just use the normal recipes. The VertSlabs are crafted exactly like Slabs – just vertical. The Nether Brick Fence recipe was changed. That way all the walls have the same recipe. It also introduces a possible Fence recipe for the future. The Nether Brick Fence recipe is now two rows of “Block, Slab, Block” instead of two rows of “Block, Block, Block”. These are recipes for things like turning Ice to Packed Ice or Dirt to Grass, Wool to String and so on. All these recipes can also be turned on/off in the config. This Mod adds the Players Head to his Drops should he die. The chance for that can be adjusted in the config or turned off completely. With a (Player) Head a bunch of Mob Heads can be crafted now too. All the recipes are turn on/off. Because the Coco Beans felt so lonely, I put in a new, better Cookie. Also, brown and red mushrooms can now be roasted in a Furnace and turn into “Roasted Mushrooms”. Besides the two new Foodtypes mentioned above, this mod also adds a new seasoning that can be applied on all Meat, Fish, Baked Potatos and the Roasted Mushrooms. That “spicy” food will have reduced Hunger gain compared to the normal version but increased Saturation. So perfect for long days in the Mines. As a little convenience service this mod also adds the Command Block and Barrier in the Redstone Tab in the Creative Menu. This can be turned off in the config in case that’s necessary. Also the red and brown mushroom block are now in the Decorations Tab.